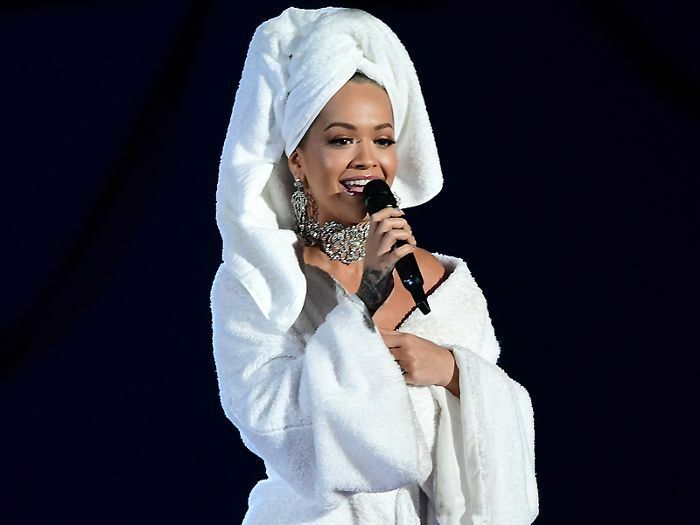 Last night Rita Ora hosted the European Music Awards here in London, and while it's commonplace to make numerous outfit changes for these gigs, Ora called on her hairstylist Brent Lawler to switch up her hair each time she changed her clothes too. Lawler was using the new Ghd Nocturne collection because when it comes to styling hair (especially at lightening speed), you need good, reliable tools to get the job done. Keep scrolling to see our seven favourite looks from the night and how to re-create them at home. We're planning to try a few of these for the upcoming party season. You? “This is Rita’s golden glitz and glamour. The large ghd curve nocturne soft curl tong (£120) was used on the very ends of the wig, in sections all around the face. These sections were then gelled down to sit flat around her face, framing the face and giving the appearance of old 1920s finger waves but more modern,” explains Lawler. “Rita and I wanted to create a fresh, fashion-forward and modern look. A crimped high ponytail was what we decided on, giving the ponytail lots of volume and lift using the new ghd contour professional crimper (£95). “Saving the best 'til last! Rita was wearing Vivienne Westwood, and I wanted to do something very over the top and creative with her hair. I straightened Rita’s hair with the ghd platinum nocturne styler (£175); it’s impossible to do this look unless the hair is completely straight. “We pared the hair in the middle and pulled it high up on the crown into a chignon; the rest of the hair we braided into small braids from the chignon down the back of her neck to mirror the same shape as the earrings and headpiece we had made for this finale look. It’s pure couture—a fashion fantasy!" Next up, crimped hair is back and it's nothing to be afraid of.